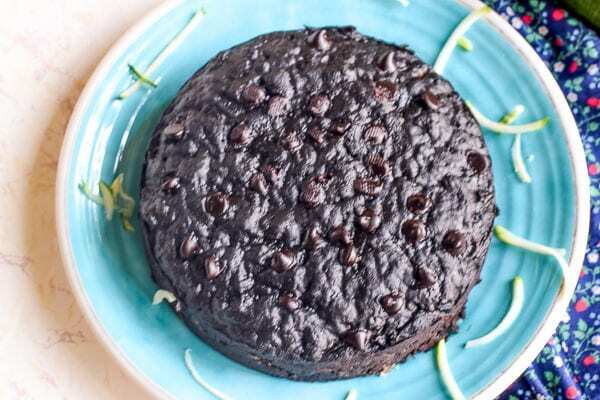 Skip the oven with this delicious recipe for instant pot double chocolate zucchini bread. That’s right – we said double chocolate! Summer is synonymous with zucchini season. And when it’s zucchini season, odds are you are up to your ears in zucchini. I have a few new recipes up my sleeve this summer. I already shared the cheesy cornbread zucchini muffin recipe with you, but needed to get this instant pot double chocolate zucchini bread recipe in front of you, too! The best part about this recipe is you can skip heating up your house by using your instant pot electric pressure cooker! Why should you cook your double chocolate zucchini bread in the instant pot? If you are skeptical, believe me when I say you won’t regret it. Quick bread cooked in the instant pot come out moist and flavorful. Sure, it takes the same amount of time as your oven. But you don’t have to use your oven. This is great not only if you don’t want to heat up your house, but if your oven is otherwise occupied by some other dish. 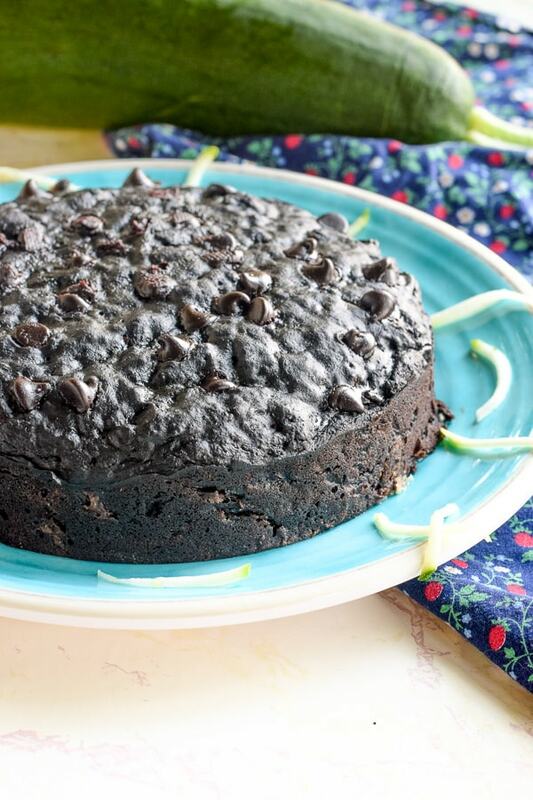 I have experimented with instant pot banana bread and instant pot funfetti cake (both success), so I was fairly certain this recipe for instant pot double chocolate zucchini bread would work. Boy, did it work! It came out so pretty – it looks more like a chocolate cake than a loaf of zucchini bread. My kids inhaled almost half of it before I cut them off. You may have noticed that I include a bit of whole wheat flour in this recipe. The majority is all-purpose flour, but you can customize it to your tastes. We have made zucchini bread using all whole wheat flour and all white flour. It just depends on your personal preference and individual tastes. I will say that if your family is not used to the whole wheat flour, but you want to start incorporating more whole grains, stick to the amounts in this recipe. It adds a touch of whole grains without the flavor being overpowering. If you are on the hunt for more zucchini recipes, try this recipe for whole wheat chocolate chip zucchini bread. 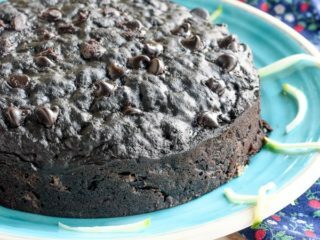 Skip the oven with this recipe for moist instant pot double chocolate zucchini bread. Grease and flour an 8-inch push pan. Fill your pressure cooker with 1 cup water and place trivet inside. In a large bowl, whisk together the all-purpose flour, whole wheat flour, sugar, cocoa powder, cinnamon, baking soda, baking powder, and salt. In a medium bowl, whisk together the eggs, vegetable oil, and vanilla. Pour the batter into the prepared push pan. Create a foil sling and lower the filled pan into the instant pot so it sits on top of the trivet. Loosely cover the top with a paper towel and fold the foil sling over the top. Cook on high pressure for 65 minutes. Carefully remove the instant pot double chocolate zucchini bread using the foil sling. Store any leftovers in an air-tight container, up to 3 days. 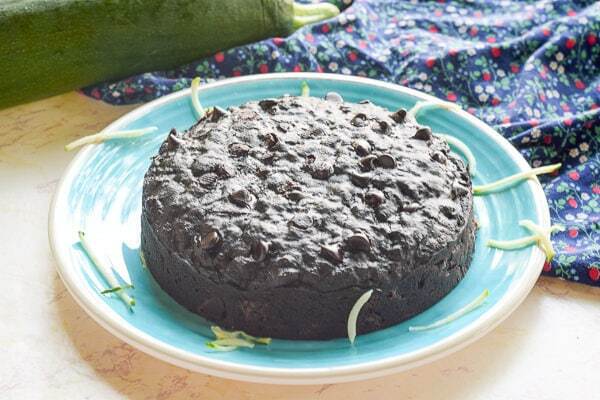 Did you try this recipe for instant pot double chocolate zucchini bread? Let us know what you thought below with a rating and comment. Or tag us in your food photos on social media using @aileencooks. All I have is a 6″ pushpan. Any suggestions for amounts and times? Hi Sue. The recipe amount is the same, but I would add 10 minutes of cook time. Enjoy!